My passion for Polyvore is known to all of you read my blog. During the day I do at least one home set and one fashion set, as it's a great way to "play" with my photos and artworks and feature society6 products with my work. I always include the work of other fellow bloggers and crafters. You can find my Polyvore profile here. Today, I'm writing all these about Polyvore because one of my home sets, Aqua Dreams, has been chosen and featured on the Top Home Sets for June 15th and also on the homepage of Polyvore. 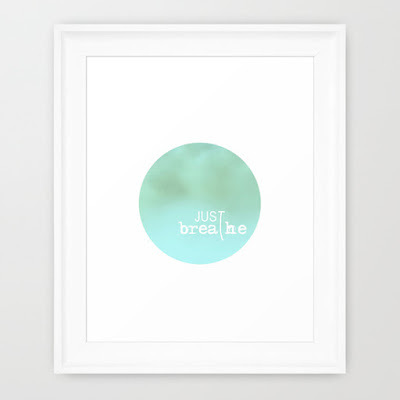 This is the second time that one of my sets is choosen (you can read about my other Top Home Set here) and it's great news as my poster "Just Breathe" feature on it. There's also the beautiful hand drawn feather of my fellow blogger Dimitra from Decor Asylum and her etsy store. So, a top home polyvore set with the artworks of two Greek bloggers is a big honour and a great chance for exposure! Thank you so much Polyvore !!! And, wish you all a beautiful Tuesday ... xoxo !!! Christina Makri 16 Ιουν 2015, 2:30:00 μ.μ. Συγχαρητήρια! Η συλλογή των τιρκουάζ πολυαγαπημένη!!!! Πάντα τέτοια Ιωάννα μου! Zina Z 16 Ιουν 2015, 3:11:00 μ.μ. μπραβο Ιωαννα!!!! η συλλογη σου αυτη ειναι μια απο τις αγαπημενες! και μπραβο και για τα εργα σας!!!! πολλες ακομα επιτυχιες και δημιουργιες ευχομαι! M. Akamatra 18 Ιουν 2015, 8:26:00 μ.μ. I am surprised at all! They are magnificent! Well done girl! Katerina Konstantinou 19 Ιουν 2015, 3:28:00 μ.μ.